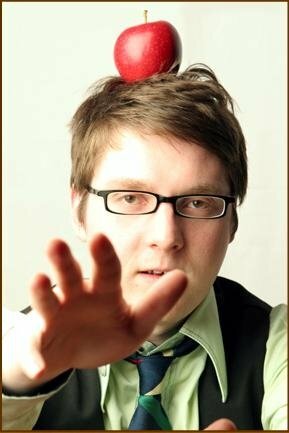 Dustin Monk is a graduate of Clarion Writers' Workshop. His work is forthcoming from or has appeared in Bull Spec, Shimmer, Digital Science Fiction, and Prime Mincer Literary Journal, among others. On his blog, spiralzine.blogspot.com, he began documenting the adventures of the club-hopping, gin-guzzling orb-weaver that had made his home outside his kitchen window but they had a falling-out, the details of which Dustin does not want to get into though if bought a sour ale may be obliged to divulge one or two juicy bits. Follow him on twitter at @dustinjmonk. 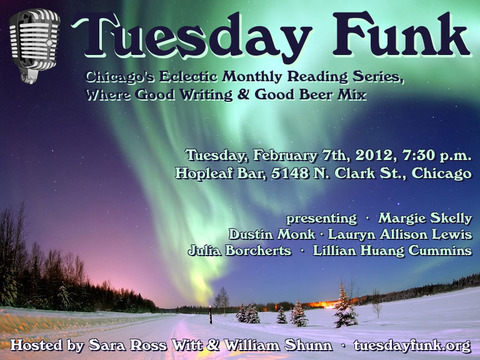 Join us Tuesday, February 7, at 7:30 p.m. at Hopleaf's upstairs bar to hear Dustin read! 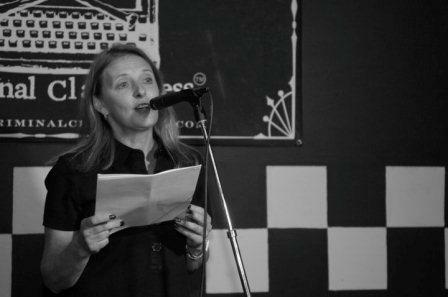 Lauryn Allison Lewis writes fiction, essays, interviews, book and bakery reviews, and everything in between. 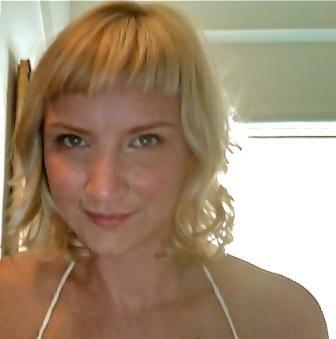 She is a managing editor at Curbside Splendor Press, assistant editor at Barrelhouse Magazine, and co-editor of Literary Chicago. Her novella, Solo Down, will be published this spring by The Chicago Center for Literature and Photography, and her debut novel, The Beauties, will be released later this year by Silverthought Press. Join us Tuesday, February 7, at 7:30 p.m. at Hopleaf's upstairs bar to hear Lauryn read! Julia Borcherts is a co-founder of Reading Under the Influence and The Chicago Way lit series, a fiction writing instructor at Columbia College Chicago, a theater columnist for RedEye and a frequent contributor to Time Out Chicago and the Windy City Times. She has been a featured reader at Victory Garden's Fresh Squeezed series, 2nd Story, the Windy City Story Slam, This Much is True, Two with Water RX, the Revolutions reading series, Two Cookie Minimum, the Museum of Contemporary Art, Women & Children First bookstore, the Criminal Class Press anti-gala and many other events and venues. Join us Tuesday, February 7 at 7:30 p.m. at Hopleaf's upstairs bar to hear Julia read! You may know 42 as the answer to the ultimate question of the meaning of life, the universe, and everything. But for Tuesday Funk it means the ultimate lineup of Julia Borcherts, Lauryn Allison Lewis, Margie Skelly, Dustin Monk, and Lillian Huang Cummins for our amazing 42nd episode. And if you hitch a ride on our literary starship, you'll have your pick of dozens of varieties of cold beer in our warm, cozy control room as we bring you an unparalleled evening of stellar entertainment. 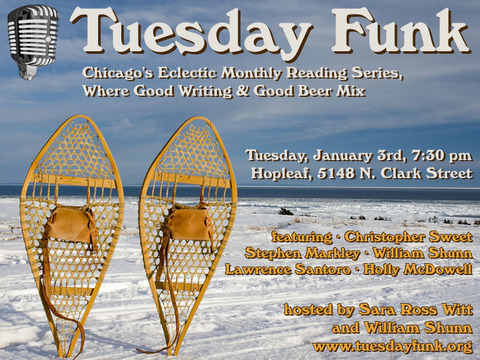 The voyage gets underway Tuesday, February 7, 2012, 7:30 pm, in the upstairs lounge at Hopleaf, 5148 N. Clark St., Chicago. Arrive early, claim a berth on the upstairs deck, and grab a beer from John at the cash-only bar. We start seating at 7:00 pm and no earlier. Admission is always free, but you must be 21 or older. And come early or stay afterward for some great Belgian-style food downstairs. Please bring plenty of friends, and become a fan of Tuesday Funk on Facebook so you never miss an invitation to our readings. Do you know where your towel is? Worldcon participants, Tuesday Funk wants you! Tuesday Funk is proud and excited that the 70th World Science Fiction Convention will be coming to Chicago from August 30 to September 3rd, 2012! It so happens that our September reading will take place Tuesday, September 4th, 2012, the day after Worldcon ends. We plan to put on an evening of great science fiction readings that nighta veritable Science Fiction Spectacularwhich means we need us some great science fiction writers. Please email us by Tuesday, May 22, 2012, to be considered for one of these five September slots. Decisions will be made by Tuesday, June 5, 2012, and announced at the Tuesday Funk reading that evening. In the past we've hosted such names as Jody Lynn Nye, Brenda Cooper, and Steven H Silver, and in the months to come we'll bring you Alex Shakar, Mary Anne Mohanraj, Richard Chwedyk, and more. Want to add your name to that roster? Drop us a line! And if you're a science fiction fan, please mark September 4th on your calendar. It's going to be a terrific evening! Video: Lawrence Santoro serves up a generous helping of "Winter Soup"
The night started out with a bang as Christopher Sweet took us back to his college days and painted us a funny and discomfiting portrait of "El Amor Brujo." Holly McDowell explored the frustrations of being an ambitious girl in the France of yesteryear, with an excerpt from her novel Farah Minor. And co-host William Shunn showed that he's a "Stand Up" guy with a story about a most unusual comedy performance. After a break for beer and a poem about Bill's cousin the burglar, we welcomed Lawrence Santoro to the microphone to lead us through a most unsettling recipe for "Root Soup, Winter Soup." Then Stephen Markley finished out the evening by attempting to explain to us (and to his idiot friends) what goes into a book about the process of publishing that book. But don't worry if you weren't there! We'll be posting video of the evening's performances over the coming days and weeks, so watch this space. And of course Tuesday Funk will be back February 7th with work from Julia Borcherts, Lauryn Allison Lewis, Margie Skelly, Dustin Monk, and Lillian Huang Cummins. Be sure to be there, and strap your shoes on tight. Reminder: Tuesday Funk #41 is tonight! Come in out of the cold! Tuesday Funk has an amazing show full of warmth and cheer all laid out for its 41st big episodeand maybe a few laughs and chills on tap, too, not to mention all that great Hopleaf beer. Our cozy yet crackling lineup tonight includes Stephen Markley, Lawrence Santoro, Holly McDowell, Christopher Sweet, and William Shunn, not to mention, if you're lucky, one of our patented bonus Poems By Bill. So "like" us today on Facebook, arrive early, grab one of dozens of varieties of beer from the bar, and get set for a evening of entertainment that will warm the cockles of your heart and make you glad to be alive in 2012. Start your new year right with Tuesday Funk. Resolve to be there! Hey, Chicago writers! Did you start the new year with a resolution to get going on that novel of yours, or on that major article? Do you need a quiet place to write as part of your freelance work, or do you just need to get out of the house to do some writing in the early morning or late at night? The Writers Workspace is here to help! The Writers Workspace is your writing space, a clean, quiet place where you can get your work done in peace, away from distractions and all those little daily chores that conspire to keep you away from your keyboard. It's also a supportive community of writers who are always willing to chat about the challenges of the writing life over a hot cup of coffee in the kitchen or lounge. Conveniently located on Broadway near the Bryn Mawr stop on the Red Line, The Writers Workspace is a place for full-time professional writers and for dedicated part-time writers alike. For a reasonable monthly or annual fee, you get access to your private writing paradise when you need it. Workspace members include Alex Shakar, Terra Brockmann, Don Seiden, Maggie Kast, Zoe Zolbrod, Marianna Swallow, William Shunn, and many of the readers you've seen featured behind the Tuesday Funk microphone at Hopleaf. Add your name to this distinguished membership roster and kick-start your writing ambitions for the year! The Writers Workspace is located at 5443 N. Broadway, next door to Graham Cracker Comics. 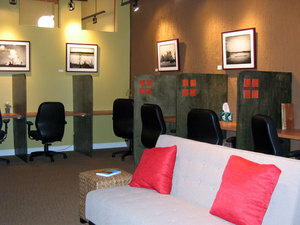 You can schedule a tour and a complimentary work visit by calling 773-907-0336, or by dropping by the website at www.writersworkspace.com. Do it! The Writers Workspace. Community when you want itpeace and quiet when you need it.